BEIRUT - Kurdish fighters expanded their offensive Tuesday after driving Islamic State of Iraq and Syria (ISIS) militants from the Syrian border town of Kobani the previous day, to retake dozens of surrounding villages still held by the militants, activists and officials said. Pushing ISIS out of Kobani after a bloody, four-month campaign was a significant boost for both the Kurds and the U.S.-led coalition, though the U.S. Central Central Command tempered Monday's victory by saying it estimated that 90 percent of Kobani was now controlled by Kurdish forces. From Kobani, Kurdish troops took the fight Tuesday to the village of Shiran, southeast of the town, said Mustafa Bali, a Kobani-based activist. Earlier in the day, they captured the nearby village of Qarah Hlanj. The Britain-based Syrian Observatory for Human Rights confirmed the capture of Qarah Hlanj and said the fighting near Shiran has intensified. 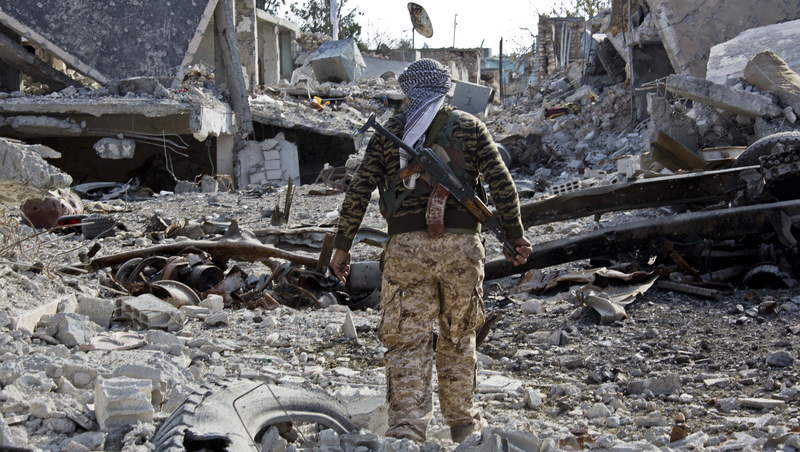 The victory in Kobani came at a high cost. "The city has been fully liberated," said senior Kurdish official Idriss Nassan, speaking by telephone from inside the town. He said Kobani is "nearly destroyed." In September, ISIS fighters captured about 300 Kurdish villages and hamlets near Kobani and thrust into the town itself, occupying nearly half of it and sending tens of thousands of residents fleeing into Turkey. The main Kurdish militia, the People's Protection Units, or YPG, aims to "liberate" all villages near Kobani area from ISIS fighters, the force's commander, Mohammed Barkhadan, told reporters Tuesday. The scope of the destruction will make it hard for refugees to return anytime soon. "The war in the town is over but the difficult task has begun," said Bali, the activist. "There is no water, electricity or sewage system." Across the border, Turkish security forces fired tear gas Tuesday to prevent about 1,000 Kurds from crossing into Kobani to celebrate, Turkey's private Dogan news agency reported. Earlier, several legislators from Turkey's pro-Kurdish party traveled to Kobani. Nawaf Khalil, a spokesman for Syria's powerful Kurdish Democratic Union Party, urged the world to help. Kobani, he said, "deserves international support for its reconstruction."